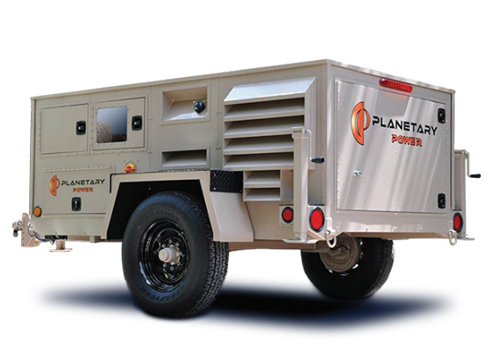 Planetary Power's HyGen is a complete reinvention of the diesel generator that combines innovations in renewable energy, battery storage and engine efficiency for a robust power generation platform. Hawaii Space Exploration Analog and Simulation (HI-SEAS) was a 120-day NASA-funded Mars simulation, located on the Mauna Loa Volcano on the Big Island of Hawaii. HI-SEAS consisted of six crew members living in an environment that simulated the extremely harsh conditions on Mars for the purpose of evaluating techniques and technologies needed for future Mars missions. The focus of this first simulation was on crew adaptation and nutrition, and it highlighted the many infrastructure challenges that must be met to successfully and safely live and work in such an isolated location. A reliable source of energy stood out as one of the most critical needs. With the look and feel of Mars (red rocks, thin air), the Mauna Loa test site at 8,500 feet above sea level presented many unique challenges that could not be met by conventional power generation technology. Traditional generators operate inefficiently at high altitude, and the treacherous access route made refueling costly and difficult. HI-SEAS needed an efficient power solution that minimized fuel usage while providing a reliable source of continuous power with minimal impact to the local environment. Planetary Power’s HyGen Hybrid Generator was the answer, providing continuous and reliable power while only using a fraction of the fuel that would have been required by a traditional generator. The HI-SEAS team selected a Planetary Power HyGen™ hybrid generator with 3kW of solar panels to deliver power for the simulation because of HyGen’s unique capability to meet the challenging requirements. HyGen’s intelligent control system operates the turbocharged engine at its most efficient operating point, while surplus energy from the engine is stored in batteries for later use. When the batteries are full, the engine turns off and loads are satisfied from the batteries. With the engine off there is zero noise to disrupt operations and absolutely no emissions. The engine automatically restarts when the batteries are depleted. The inclusion of solar panels keeps the batteries charged longer, further reducing engine fuel consumption and run time. Prior to deploying HyGen, the HI-SEAS site was powered by a conventional 6.8 kW diesel generator. HyGen reduced average fuel consumption at the site from 13 gallons to 2.26 gallons per day, a decrease of 83%. HyGen also significantly improved the amount of energy generated per gallon of fuel consumed (specific fuel consumption), increasing efficiency from 5.5 kWh to 31.9 kWh per US gallon, an increase of 477%. Hygen’s efficiencies resulted in significant financial savings and operational improvements. By the end of the first month, Hygen saved $1,267 in avoided fuel costs alone. However, the price at the pump is not the only consideration when looking at the cost of off-grid energy. Refueling logistics adds nearly 25% to the cost of fuel, giving an overall cost per gallon of $4.95, and including maintenance increases the total energy costs even further. Reducing the number of refueling trips and maintenance cycles saved HI-SEAS $2,513 per month or approximately $30,000 per year when compared to a conventional generator. 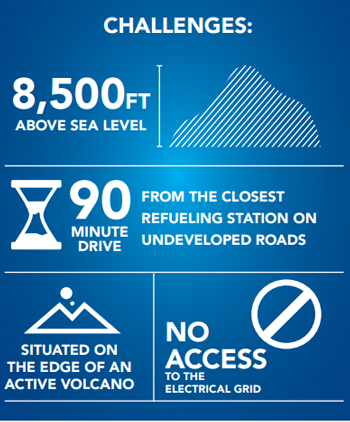 Over a five year period, HyGen accumulates considerable fuel, logistics and maintenance savings. Because of its comparable long usable lifetime, HyGen also has high residual value at the end of five years whereas traditional generators will need a complete replacement at least once during the five year period. 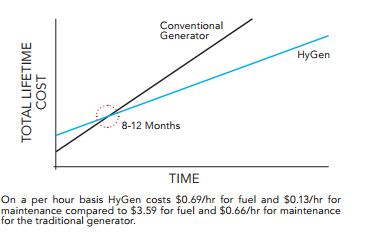 Even in a continuous usage scenario, such as HI-SEAS, HyGen has a projected life of 10 years compared to only 2.5 years for a conventional generator. Over the course of a 5 year deployment, HyGen will save well over $150,000. The HyGen is a fully-integrated system that includes everything needed to generate, control and monitor renewable and conventional energy. Solar and wind power integrate seamlessly with HyGen without the need for costly inverters or control equipment. Control HyGen from any location and remotely monitor performance, fuel consumption, and upcoming maintenance. HyGen saves money by consuming up to 80% less fuel than a conventional generator, thus extending service intervals, reducing fuel costs and lowering environmental impact. HyGen combines the reliability and dependability of a conventional generator with the low environmental impact of renewable energy, and it costs less per kWh than conventional or renewable solutions. HyGen’s engine never idles and always runs at its most efficient operating point, resulting in the most power for the least amount of fuel. When the batteries are fully charged, the engine turns off automatically and the batteries provide silent emissions-free power to any load. Seamlessly bridge multiple HyGen units together to meet any power demand with unmatched efficiency. The control system synchronizes multiple HyGen units and optimizes power production to create an instant highly efficient micro-grid.